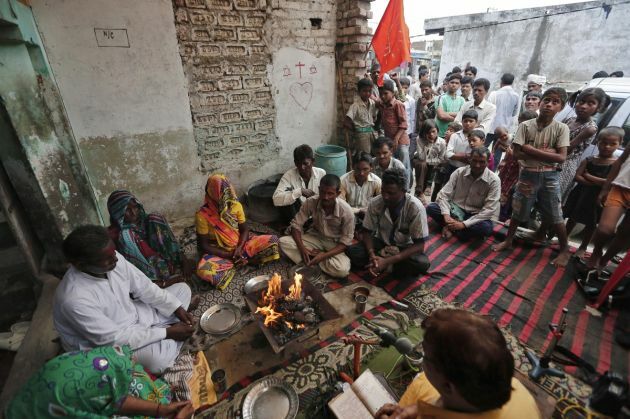 (Photo: REUTERS / Adnan Abidi)People take part in a religion conversion ceremony from Christianity to Hinduism at Hasayan town in the northern Indian state of Uttar Pradesh August 29, 2014. India's Christian community have condemned attacks on churches by Hindu extremists pleading that the world's second most populous nation should not become a theocracy. About 100 Christians from remote districts known locally as tribals were reportedly converted to Hinduism at an event organised by the extremist Vishwa Hindu Parishad in south Gujarat's Valsad on December 20. The VHP claimed that these tribals were Hindus who had earlier converted to Christianity and now were returning to Hinduism, India's NDTV reported on December 21. The head of India's most powerful Hindu group vowed to press ahead with a campaign to convert Muslims and Christians to Hinduism, Reuters news agency reported on the same day. The report said the conversions are stoking a sensitive debate that has stalled parliament and threatened Prime Minister Narendra Modi's economic reform agenda. Mohan Bhagwat of the rightwing Rashtriya Swayamsewak Sangh, which is also the ideological wing of Modi's party, said India is a "Hindu nation" where many Hindus have been forcibly converted to other religions. "We will bring back those who have lost their way. They did not go on their own," Bhagwat said in a speech late Saturday. "They were lured into leaving." Bhagwat's comments came after Modi's Bharatiya Janata Party said it does not support forced religious conversions and called for an anticonversion law. Some 80 percent of India's 1.23 billion people are predominantly Hindus but there are also about 160 million Muslims 2.3 percent of them are Christians. The Christian community in India has been feeling a sense of apprehension and fear at the incidents of violence against Churches and their personnel in various parts of the country, Vatican Radio reported on December 20. Christian leaders released a joint statement on the situation of religious freedom in the country on December 19. The statement noted "great concern of the sense of apprehension and fear in our community at the incidents of violence against our Churches and personnel in various parts of the country." It referred specifically to "Chhattisgarh, Madhya Pradesh, Odisha, Uttar Pradesh and now in the National Capital Territory of Delhi where the St. Sebastian's Church in Dlishad Garden, East Delhi was torched in what we think is an act of malicious arson on 1st December 2014." The statement said, "The gutting of the St. Sebastian's Church, as well as the other incidents of targeted violence in other parts of the country, speak of extreme police and administrative impunity and disregard not only to the sentiments and religious feelings of our community but also the guarantees of the Constitution of India." Among those who signed the statement were the Roman Catholic Archbishop Anil Couto, of Delhi, Archbishop Kuriakose Bharanikulangara, of the Faridabad Syro-Malabar Catholic Eparchy and Bishop Jacob Barnabas, of the Syro-Malankara Catholic church along with many other leaders of Christian denominations in India. They decried a series of interconnected actions by various non-State actors closely associated with the ruling dispensation. The Christians took strong exception to a program of hate and religious nationalism of Hindu extremists which they see as an attempt to sabotage India's Constitution that guarantees freedom of faith. The statement states, "With its wonderful diversity and ancient cultural, linguistic and ethnic identity, the State maintains equal respect for all faiths, and for people who profess no faith. "In a secular and democratic India, there is no place for a State religion. India is not a theocracy. Religion has no place in the national political discourse." The statement cites several cases of social boycott, physical assaults and cases of desecration of and restrictions on house churches or building churches. It expresses a hope and prays that such discrimination and targeted violence will be ended by strong political will and administrative action. The Christians have also demanded an assurance from the government that they are protected, with security and safety in their motherland.